When you are working with a database, or any other kind of software, your experience is enhanced or hindered by the tools you use to interact with it. PostgreSQL has a command line tool, psql, and it’s pretty powerful, but some people much prefer a graphical editor. Even if you typically use command line, you may want to go visual sometimes. At Microsoft we’ve spent many years building experiences to enhance developers’ day-to-day productivity. Having choices is important. It allows you to go with the tool that works for you. 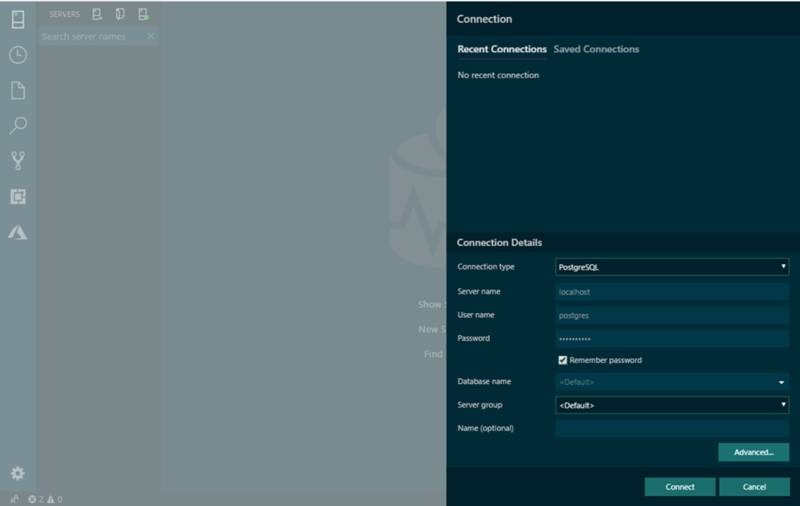 Today we’re excited to announce preview support for PostgreSQL in Azure Data Studio. Azure Data Studio is a cross-platform modern editor focused on data development. It’s available for Linux, MacOS, and Windows. 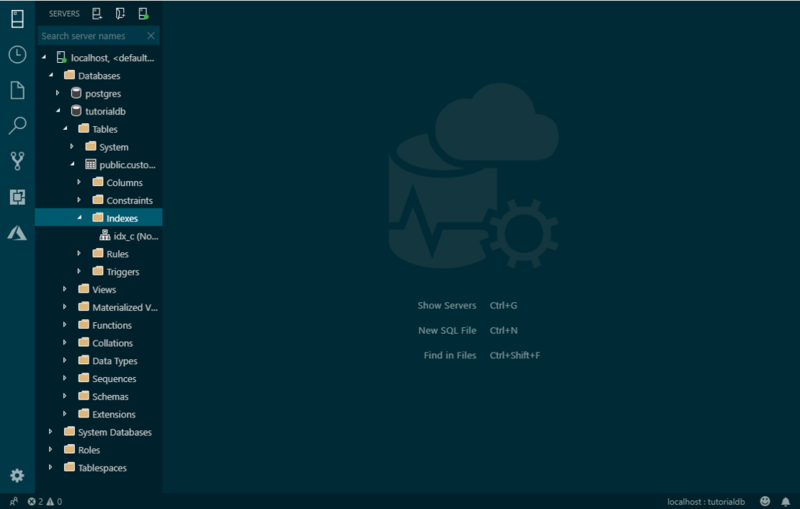 Plus, Azure Data Studio comes with an integrated terminal so you’re never far away from psql. We’re also introducing a corresponding preview PostgreSQL extension in Visual Studio Code (VS Code). 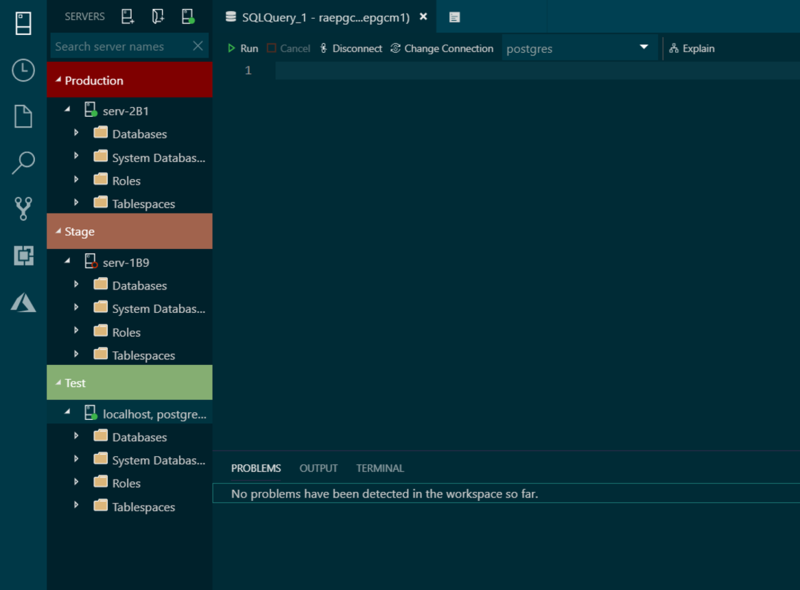 Both Azure Data Studio and VS Code are open source and extensible – two things that PostgreSQL itself is based on. Azure Data Studio inherits a lot of VS Code functionality. It also supports most of VS Code’s extensions like Python, R, and Kubernetes support. If your primary use case is data, choose Azure Data Studio. You can manage multiple database connections, explore database object hierarchy, set up dashboards, and more. 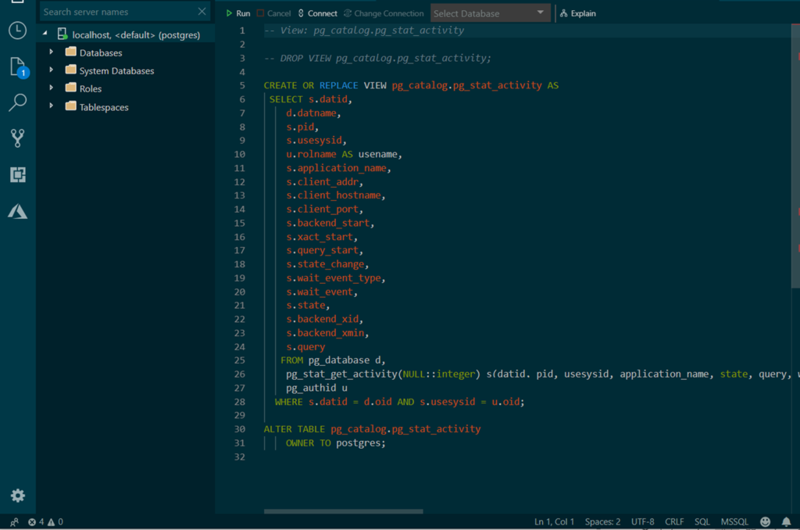 On the other hand, if you’re closer to application development than you are to database administration, then go for our PostgreSQL extension in VS Code. Actually, you don’t have to choose – use both, switching according to what works best for you at the time. Your Postgres server evolves as you add new functionality. It’s helpful to be able to clearly see what columns, indexes, triggers, and functions have been created for each database and table. This is especially true when you’re not the only person working on that Postgres instance. Azure Data Studio provides convenient hierarchical navigation in the sidebar. With it you can easily explore and keep track of your server’s databases, tables, views, and other objects. The personalization options extend to key bindings as well. Don’t like using the default Ctrl+N to open a new tab? You can change it. Or maybe you want a keyboard shortcut that doesn’t come out of the box with Azure Data Studio. You can create and customize key bindings using the Keyboard Shortcuts editor. There are even more features to discover, like Git source control integration and customized dashboards and widgets. You can start using the preview for PostgreSQL in Azure Data Studio today – check out the install instructions. To start using our preview PostgreSQL extension for Visual Studio Code, learn more on our GitHub page.